A representative of Far and Wild Safaris will collect you from the O R Tambo International Airport or from your overnight accommodation in Johannesburg and travel through the Highveld industrial, mining and agricultural areas. Our guide will make this section interesting, adding value with his interpretation of the local history and sights. The scenery is pretty flat but changes as we approach the Drakensberg Escarpment, where we drop down to the Lowveld through scenic passes. This Drakensberg Escarpment area has scenic vistas over the Lowveld of the Kruger National Park. The fresh mountain scenery and panoramic views over the Klein Drakensberg escarpment are quite spectacular and give the area its name of 'Panorama Route'. The geology and climate of this high rainfall plateau results in masses of waterfalls. Some are hidden deep within some of the largest man-made forestry plantations in the world, with row upon row of pine and eucalyptus trees. We will visit the Panorama Escarpment and some of the view-sites such as God's Window, Blyde River Canyon, Berlin and Lisbon waterfalls, etc. and overnight at Hannah Lodge (or similar). Hannah is a reflection of Africa in its entire natural splendour, a captivating tapestry of African sounds, smells and colours. The rising sun showers the valley with shades of pink, red and orange. We leave Reilly's Rock travelling through rural Zululand and proceed to the Hluhluwe uMfolozi Park where we would spend the night at Hilltop Camp. The accommodation here is in a brick under thatch chalet, each bedroom with its own private bathroom/wash-basin and toilet. Each chalet is also equipped with a fridge. Our game viewing commences immediately upon entering the gates into the park. This first evening we go on a sunset drive in an open game-viewing vehicle with staff from KZN Wildlife, the organisation that is tasked with running this reserve. This is to improve on your chances of seeing some of the nocturnal species such as leopard, lion, hyena, genet, bush babies and then the other nocturnal animals such as the owls and nightjars. 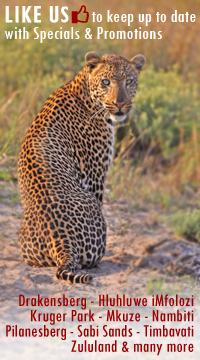 Today will be spent on extended game drives to various areas of the Park, with an early start to make the most of the day and to possibly chance upon one of the predators returning to their day-time lair. Set in the heart of Zululand, this is the oldest game reserve in Africa, where Zulu kings such as Dingiswayo and Shaka hunted and put in place the first conservation laws, where today the "big five" of African legend stalk the verdant savannah. Established in 1895, game viewing is the prime attraction. As the home of Operation Rhino in the 1950s and 60s, the Park became world renowned for its white rhino conservation. The Park covers some 96 000 ha and contains an immense diversity of fauna and flora. Hluhluwe is characterised by hilly topography, and this northern section of the park is noted for its wide variety of both bird and animal life. Sightings of rhino, giraffe, buffalo, wildebeest, zebra, warthog, baboon, vervet monkey, and antelope such as impala, nyala and kudu are seen frequently and with the possibility of seeing lion, leopard, cheetah, elephant, black rhino, hippo, crocodile, monitor lizard, hyena and antelope such as red duiker, steenbuck, waterbuck, bushbuck and then the rare Samango monkey and wild dog, much less frequently. These drives are conducted with your guide in his/her vehicle. After our two-hour cruise and lunch we make our way back to Durban, arriving in time for your departure flight from the King Shaka International Airport or to drop you off at your overnight accommodation.